The wearables market may have created a lot of buzz over the past few quarters, but looks like it will take some more time for that buzz to convert into genuine consumer interest. According to a latest research report from GlobalWebIndex, which surveyed around 170,000 adult internet users across 32 markets, only 9% said they have a smartwatch, and even less, 7%, said they own smart wristbands. 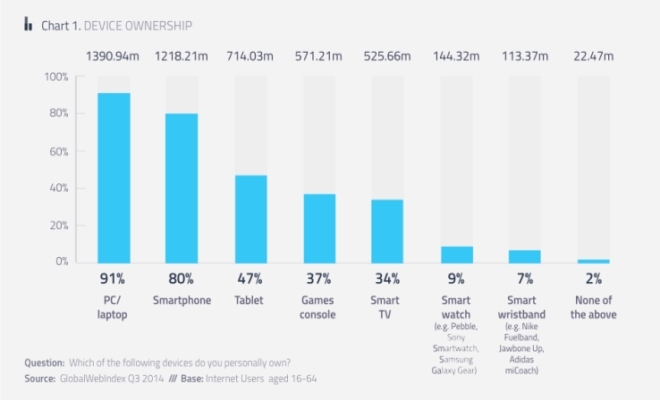 In contrast, around 80% of the people surveyed said they own a smartphone. While that’s undoubtedly a major chunk, it’s still less than the proportion (91%) using PCs. 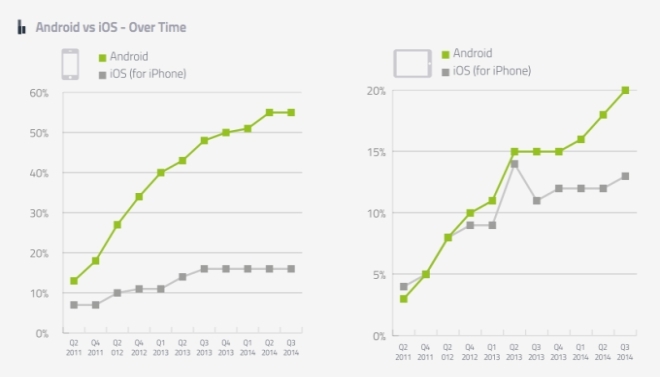 As for Android vs iOS, the data presented in the report puts the former far ahead of the latter (see image below). Just to give you an idea in terms of numbers, the ratio of Android to iOS users was just under 2:1 back in 2011, but it increased significantly to approach 3.5:1 last year. Moving on, the report says that out of those owning a smartphone, 75% said they access mobile Internet services on their device. It also notes that on an average, people spend 1.85 hours/day on their mobile devices, up by around 40 minutes compared to 2012. Finally, the report also highlights the usage of Virtual Private Networks (VPNs), with around 27% of respondents saying they used VPNs to go online. Of all content services accessed by VPN as well as regular Internet users, Google Play topped the charts. GlobalWebIndex is a market research firm that provides global insight into consumer behavior online.